Anyway, the reason I'm posting is to show off this necklace I made in a flash the other day. 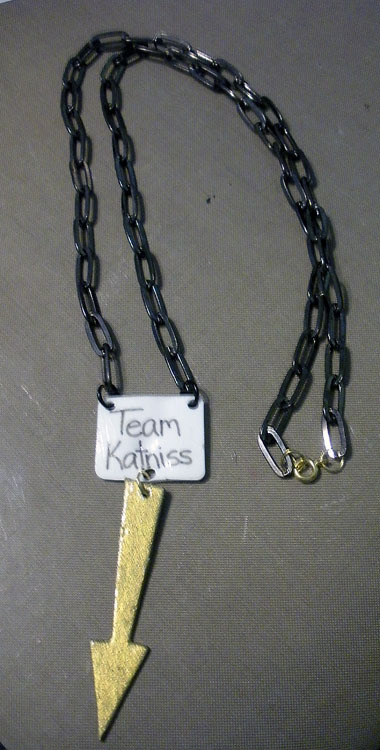 I had a teenage friend of mine ask me if I could make her a Hunger Games necklace. I responded that there was no way I was going to be able to make a MockingJay, but she retorted that it could be as simple as an arrow. Why I didn't think of that I have no idea. Time was short, but I wanted to see what I could come up with, so this was thrown together. 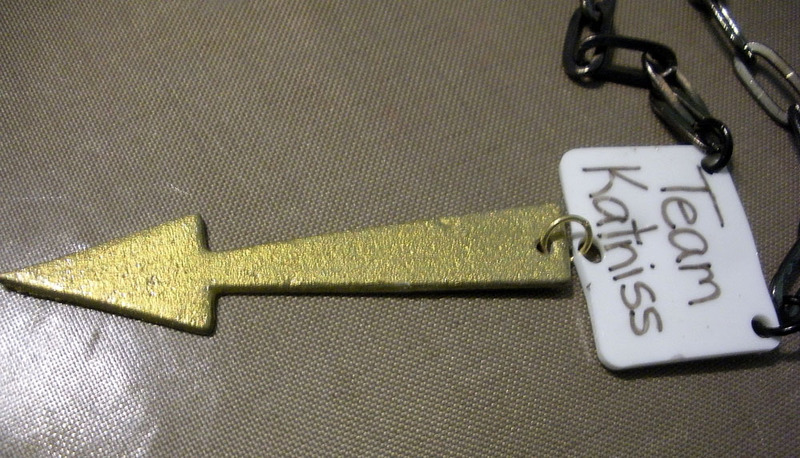 Paint the grungeboard arrow with the gold paint and then cover it with gold Pearl Ex powder. While it dries, cut out a square of shrink plastic and round the corners with a paper punch. With the Sharpie, write "Team Katniss" on it, then punch two holes on either side of the top and one in the center bottom. 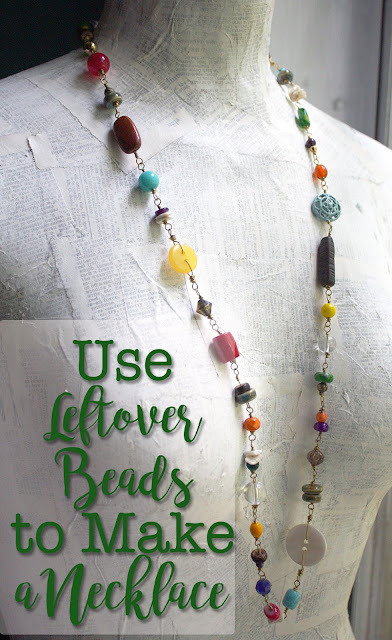 Use a heat gun to shrink the plastic. With the Glossy Accents, seal all sides of the arrow and the front of the plastic (sharpie will rub off over time). Use a gold jump ring to attach the arrow to the bottom of the plastic and the black jump rings to attach the chain to each side of the top. Find the center of the chain and add the clasp with the other two gold jump rings. DONE! This project took me very little time and my friend seemed to be pleased with the necklace she'll be wearing to the movie tonight! WIN! Now to decide if I want to make one for myself! I saw the previews for this movie a while back at the last movie I went to in the theater it looks like it will be good. I did not know until recently that there are books. Duh of course there are books (slap on the forehead) Have a great time at the movie I hope it is as good as it is hyped up to be.